Time passes so quickly, and some things never change. As a student, 35 years ago, I was forced to attend the school swimming sports. Now that I'm a teacher, I'm forced to attend the school swimming sports. Only now I have responsibilities and duties. Ah yes, the halcyon days of youth. 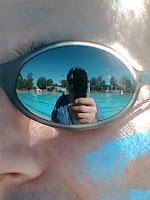 Late summer, sitting on the grass near the pool, watching all the athletic kids line up and take the races seriously. My friends and I would sit around, talking, eating snacks, discussing music and listening to lots of tunes on one of those 1970s cassette players. Very cool, for the time. I seem to recall lots of Beatles music, but that's just me and the kind of kids I hung around with. And at the school swimming carnival a few days ago I saw pretty much the same behaviour from our students. Right down to the music. So OK, it's all digital now rather than cassettes, and it was more communal in those days. The kids now have it on earphones on Mp3s - probably illegally downloaded - and their listening is an isolated experience. Some things change, and we discuss whether it's for the better or not. But at heart kids are still kids - they're just trying to cope with a rapidly changing world.